While it's true that we all make mistakes, some mistakes are more public than others. How do you handle those mistakes that everyone knows about? Come close and listen: the answer lies in your relationship to the man from Galilee. It's about forgiveness... choices... understanding who you are in God's eyes. Read on and learn what the Savior says about our mistakes. As Brazilian jail cells go this one wasn't too bad. There was a fan on the table. The twin beds each had a thin mattress and a pillow. There was a toilet and a sink. No, it wasn't too bad. But, then again, I didn't have to stay. Even more striking than his name (pronounced "uh-nee-ball") was the man himself. The tattooed anchor on his forearm symbolized his personality — cast-iron. His broad chest stretched his shirt. The slightest movement of his arm bulged his biceps. His face was as leathery in texture as it was in color. His glare could blister a foe. His smile was an explosion of white teeth. But today the glare was gone and the smile was forced. Anibal wasn't on the street where he was the boss; he was in a jail where he was the prisoner. He'd killed a man — a "neighborhood punk," as Anibal called him, a restless teenager who sold marijuana to the kids on the street and made a nuisance of himself with his mouth. One night the drug dealer had used his mouth one time too many and Anibal had decided to silence it. He'd left the crowded bar where the two of them had been arguing, gone home, taken a pistol out of a drawer, and walked back to the bar. Anibal had entered and called the boy's name. The drug dealer had turned around in time to take a bullet in the heart. I came to know Anibal through a Christian friend, Daniel. Anibal had lifted weights at Daniel's gym. Daniel had given Anibal a Bible and had visited him several times. This time Daniel took me with him to tell Anibal about Jesus. But as we began to discuss conversion, Anibal's face began to harden. The head that had leaned toward me in interest now straightened in caution. Anibal didn't like my statement that the first step in coming to God is an admission of guilt. He was uneasy with words like "I've been wrong" and "forgive me." Saying "I'm sorry" was out of character for him. He had never backed down before any man, and he wasn't about to do it now — even if the man were God. In one final effort to pierce his pride, I asked him, "Don't you want to go to heaven?" Earlier he might have boasted yes, but now he'd heard too many verses from the Bible. He knew better. But I was wrong. The eyes that lifted to meet mine weren't tear-filled; they were angry. They weren't the eyes of a repentant prodigal; they were the eyes of an angry prisoner. "All right," he shrugged. "I'll become one of your Christians. But don't expect me to change the way I live." The conditional answer left my mouth bitter. "You don't draw up the rules," I told him. "It's not a contract that you negotiate before you sign. It's a gift — an undeserved gift! But to receive it, you have to admit that you need it." "OK." He ran his thick fingers through his hair and stood up. "But don't expect to see me at church on Sundays." I sighed. How many knocks in the head does a guy need before he'll ask for help? The prison of pride. For most of us it isn't as blatant as it was with Anibal, but the characteristics are the same. The upper lip is just as stiff. The chin ever protrudes upward, and the heart is just as hard. 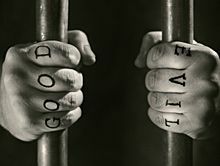 A prison of pride is filled with self-made men and women determined to pull themselves up by their own bootstraps even if they land on their rear ends. It doesn't matter what they did or to whom they did it or where they will end up; it only matters that "I did it my way." You've seen the prisoners. You've seen the alcoholic who won't admit his drinking problem. You've seen the woman who refuses to talk to anyone about her fears. You've seen the businessman who adamantly rejects help, even when his dreams are falling apart. Perhaps to see such a prisoner all you have to do is look in the mirror. "If we confess our sins, he is faithful and just... "*1 The biggest word in Scripture just might be that two-letter one, if. For confessing sins — admitting failure — is exactly what prisoners of pride refuse to do. "Well, I may not be perfect, but I'm better than Hitler and certainly kinder than Idi Amin!" "Me a sinner? Oh, sure, I get rowdy every so often, but I'm a pretty good ol' boy." "Listen, I'm just as good as the next guy. I pay my taxes. I coach the Little League team. I even make donations to Red Cross. Why, God's probably proud to have somebody like me on his team." "Blessed are those who mourn... "
To mourn for your sins is a natural outflow of poverty of spirit. The second beatitude should follow the first. But that's not always the case. Many deny their weakness. Many know they are wrong, yet pretend they are right. As a result, they never taste the exquisite sorrow of repentance. He was nitroglycerin; if you bumped him the wrong way, he blew up. He made a living with his hands and got in trouble with his mouth. In some ways, he had a lot in common with Anibal. If he had had a tattoo, it would have been a big, black anchor on his forearm. If they had had bumper stickers, his would have read, "I don't get mad; I get even." He was a man among men on the Galilean sea. His family called him Simon, but his master called him "Rocky." You know him as Peter. The winds roar down onto the Sea of Galilee like a hawk on a rat. Lightning zigzags across the black sky. The clouds vibrate with thunder. The rain taps, then pops, then slaps against the deck of the boat until everyone aboard is soaked and shaking. Ten-foot waves pick them up and slam them down again with bonejarring force. These drenched men don't look like a team of apostles who are only a decade away from changing the world. They don't look like an army that will march to the ends of the earth and reroute history. They don't look like a band of pioneers who will soon turn the world upside down. No, they look more like a handful of shivering sailors who are wondering if the next wave they ride will be their last. Peter would rather swallow pride than water! And you can be sure of one thing. The one with the widest eyes is the one with the biggest biceps — Peter. He's seen these storms before. He's seen the wreckage and bloated bodies float to shore. He knows what the fury of wind and wave can do. And he knows that times like this are not times to make a name for yourself; they're times to get some help. So, Peter consults his notes, removes his glasses, clears his throat, and asks a question any good attorney would. "Ahem, Jesus, if you would kindly demonstrate your power and prove your divinity by calling me out on the water with you, I would be most appreciative." I don't buy that. I don't think Peter is seeking clarification; I think he's trying to save his neck. He is aware of two facts: He's going down, and Jesus is staying up. And it doesn't take him too long to decide where he would rather be. Perhaps a better interpretation of his request would be, "Jeeeeeeeesus. If that is you, then get me out of here!" "Come on" is the invitation. And Peter doesn't have to be told twice. It's not every day that you walk on water through waves that are taller than you are. But when faced with the alternative of sure death or possible life, Peter knows which one he wants. Anibal would be more concerned about his image than about his neck. He would prefer to go under rather than let his friends hear him ask for help. He would rather go down "his way!" than get out "God's way." As long as Jesus is one of many options, he is no option. As long as you can carry your burdens alone, you don't need a burden bearer. As long as your situation brings you no grief, you will receive no comfort. And as long as you can take him or leave him, you might as well leave him, because he won't be taken halfheartedly.